Oct. 22, 2012 – London, UK – One of the most celebrated, yet controversial, UK bands of the 1960s, The Move, are finding themselves in the spotlight once again with the release of ‘The Lost Broadcasts’ on DVD by Gonzo MultiMedia. 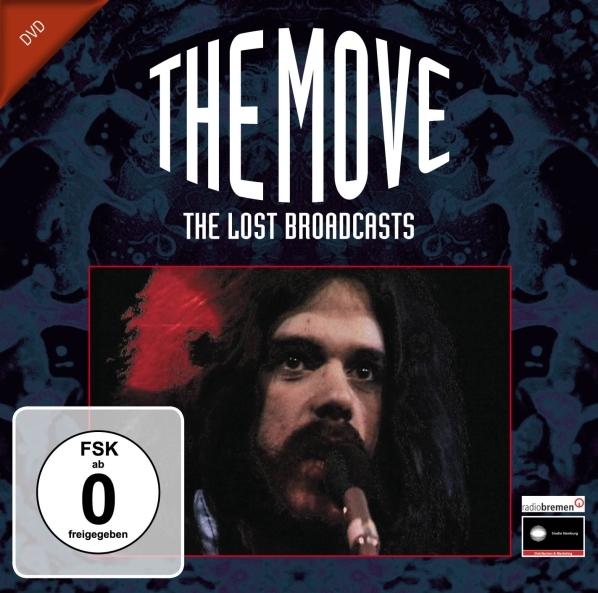 Culled from various performances on German TV between 1968 and 1971, ‘The Move – The Lost Broadcasts’ DVD is a must for all fans and collectors of the famed group. The Move were undoubtedly one of the most influential and interesting groups of the 1960s, and it could well be argued that the reason that they didn’t get as famous as some other bands was that they came from Birmingham not London, and were based in the Midlands throughout their career. They were formed in 1965 by bassist-vocalist Chris “Ace” Kefford who was the original leader. However he was soon usurped by the multitalented guitarist, singer and songwriter Roy Wood who undoubtedly one of Rock music’s true polymaths. He composed all the group’s UK singles and, from 1968, also sang lead vocals on many songs, although Carl Wayne was the main lead singer up to 1970. Beside Wood and Kefford, the original five-piece line-up of The Move in 1965 was drummer Bev Bevan, bassist Kefford, vocalist Carl Wayne and guitarist Trevor Burton. Initially the band had 4 main vocalists (Wayne, Wood, Trevor Burton and Kefford). They were originally planned as a noisy pop art rock band in a similar style to The Who, but it wasn’t long before they developed a new and provocative style of their own. At the time, many bands were questioning the role of the rock musician. They were unwilling to continue being merely entertainers and felt that, to use a 21st Century expression, they had to ‘think outside the box’ in order to find new and exciting ways to present their art to the public. In the beginning, the band was as known for their outrageous stage persona as for the music. They went on stage dressed as gangsters and lead singer Wayne took an axe to TV sets and busts of Adolf Hitler. They even produced a libellous postcard featuring then Prime Minister Harold Wilson in bed with his private secretary Marcia Falkender – a prank which landed them in court. But, nearly five decades on, the outrage and excesses are largely forgotten, and The Move are now only really remembered for the music – fourteen singles (nine of which were hits, “Blackberry Way” reaching the coveted #1 position, and four albums. But unlike their next projects, they had no commercial success in the United States, and remain shockingly undervalued. The music got better and better as Roy Wood progressed as a songwriter, but when Carl Wayne left in 1970 he was replaced by Jeff Lynne, late of massively under-rated band The Idle Race, and the dynamic of the band changed forever. The final line-up of 1972 was the trio of Wood, Bevan and Jeff Lynne, who were also launching another band – the Electric Light Orchestra. Ella James 4mins 4 secs 25/11/71 (Colour).